There are only so many jobs out there where you get to sell something you - hand on heart - can say that you use everyday and, frankly, wouldn’t be able to manage your job without. As a Business Development Manager at Vainu I have the great opportunity of doing just this. Working in a highly sales-driven organization, selling a sales prospecting tool in the forefront means that I eat my company’s own dog food, so to speak, every day. With the use of Sales Intelligence platform Vainu, you can find and analyze the best leads out of the over 70 million companies in our data-powered database and know when is the right time to contact them. Using the tool’s hundreds of filters, you’re bound to find the best sales prospects for your company, whether it's financial information, location, industry, business domain, web technologies, certain words on website, recruitments, mobile applications, social media presence or any other characteristic that you're after. And we’ve received great proof of concept. A data-driven, account-based approach is the most efficient and cost-effective sales strategy today, resulting in up to 50% more meetings and 36% more closed deals over older sales models. Working in a highly sales-driven organization, selling a sales prospecting tool in the forefront means that I eat my company’s dog food, so to speak, every day. 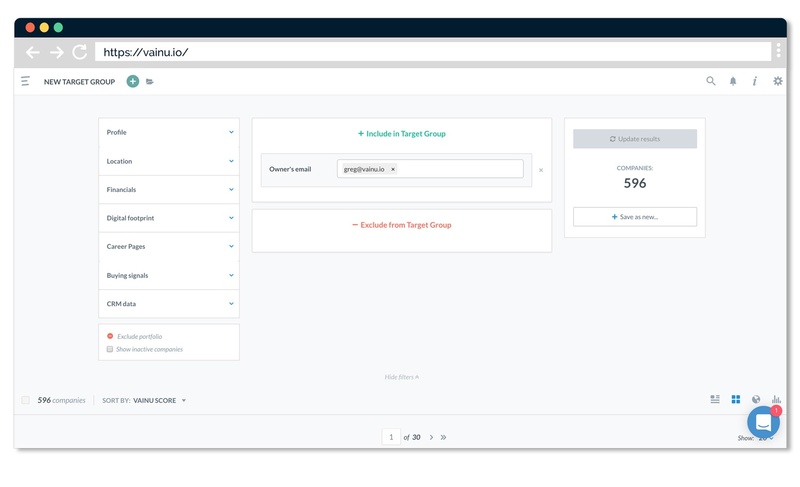 There’s a reason why my coworkers and I, along with our customers, rely on Vainu: The platform allows us to identify the best accounts to target, track buying signals, analyze companies, create smart target groups and find the right time to reach out to both new and old connections. Read on for a look at how I use Vainu every day and some tips and tricks for how to get the most out of our data. Vainu’s 100+ filters make it easy to find companies matching my Ideal Customer Profile(s) to a T. I’ve created smart target groups (portfolios) in Vainu, including companies with characteristics that imply they are a great fit for Vainu and set up email notifications to stay up to date with changes in their organization. I start my days flickering through the email notifications I’ve received from Vainu overnight to see if any new companies match the set of criteria I’ve set up for a solid sales prospect. If a company has sent out a buying signal that indicates it’s now a good time for me as a salesperson to get in touch, I make sure to do so immediately. Thanks to information from open and public data, Vainu's smart target groups updates automatically as companies' characteristics change. At Vainu we use Pipedrive CRM. Using our two way integration with Pipedrive CRM (we also integrate with Salesforce Sales Cloud, Microsoft Dynamics and a number of other CRM systems) I can be sure to only prospect solid AND available leads. By capitalizing on CRM data in my sales prospecting with Vainu, I can filter out companies that are owned by someone in our organization or that have been contacted in recent months. In other words, this helps me get to the most relevant prospects quicker. Using Vainu's two-way integration with Pipedrive CRM, I can filter companies already in our CRM system that haven't been contacted in recent months. I don’t only use Vainu’s portfolio and email notification functions to monitor changes in new prospects. I’ve also created smart target groups including my current prospects and customers and subscribed to reports with trigger signals from them to stay up-to-date with the most important changes in their organization. This way I can work proactively and act on changes that have an impact on my current sales processes or that indicate that one of my existing customers is eligible for an upsell. Bonus tip: Thanks to Vainu’s Pipedrive integration, it only took me a minute to create a target group with all companies I’ve closed a deal with. And now, this list updates automatically as soon as I’ve received a new customer and tagged this in Pipedrive. 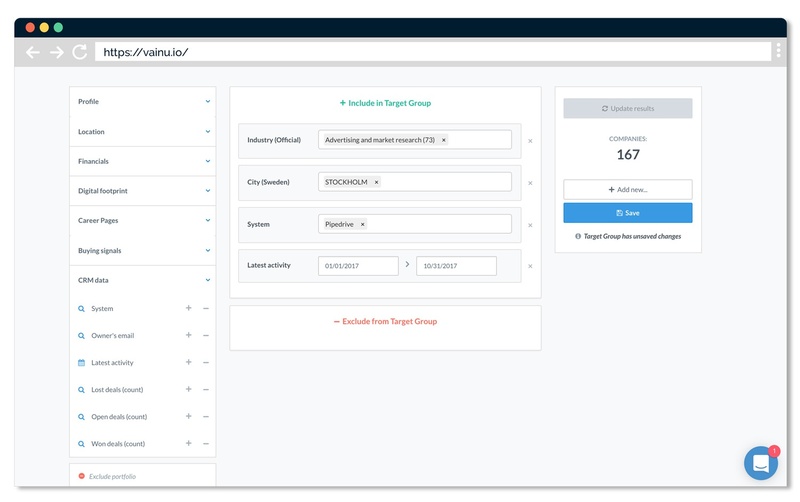 Create a smart target groups with all your prospects in just a few seconds thanks to Vainu's integration with Pipedrive CRM. Before every cold call and ten minutes before every sales meeting I always log on to Vainu and check the company card of the company I’m about to talk to and go through its characteristics. I know that understanding their business and pain points will help me carry out smarter and better tailored conversations - something that increases my chance of closing the deal. I always start looking for whether a company is using any of the CRM softwares that Vainu integrates with. This one is using Salesforce Sales Cloud - Nice! I’ll definitely leverage that in my pitch. I’m also checking what trigger signals the company has been sending out lately and going through what other technologies the company is using. For example: If the company is using a Marketing Automation technology, this is valuable information for me as I’m selling an advanced technical solution – even though Vainu is in a different vertical. Companies using Marketing Automation often have a higher level of technical sophistication. Another way to find out roughly how mindful a company is of new technology is through Vainu’s digitalization filter. Whenever I receive an inbound lead or a lead through recommendations, I always check the organization’s company card in Vainu and compare its characteristics with our Ideal Customer Profile(s). 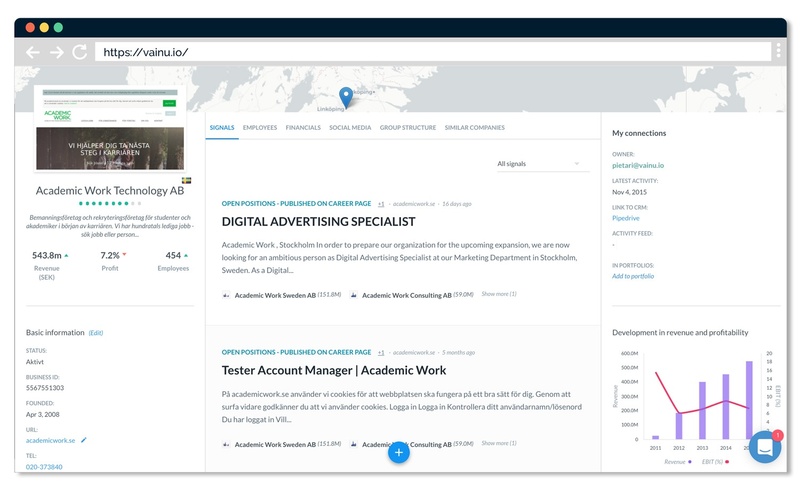 Even though someone within a company has expressed a clear interest in our tool — for example, through requesting a demo on our site — I want to make sure that the company is a good fit for our organization. Basically, I want to make sure I’m not spending time trying to sell to — or actually selling to — a company that will not receive a clear value from our product. This doesn’t benefit either party. Find a company’s latest buying signals, financial figures and get to know what technologies it uses on the Company Cards in Vainu. About once a month I run all my won and lost cases through Vainu’s analyzer function. This way I can quickly see the shared characteristics of these companies and find out what types of companies I’ve had the highest and lowest hit rate with. Finding out I have five times better hit rate with companies using Marketing Automation than the ones without this technology can help me sharpen my Ideal Customer Profile and focus my sales efforts on companies most likely to put ink on a contract. Using Vainu Analyzer you can easily find out what characteristics the companies you've closed the last months share. Make sure you spend your sales efforts on the companies that are most likely to convert into paying customers. Using Vainu's Sales Intelligence Platform as a Business Development Manager at Vainu helps me target the right accounts at the right time. In other words, find and reach out to those prospects who will benefit the most from using Vainu right now. I've created smart target groups with companies matching my Ideal Customer Profile(s) and stay up-to-date with the buying signals they send out through email and in-app notifications. Create smart target groups including all my current prospects and customers. Now, I easily stay up-to-date with important changes in their organization. Always prospect solid AND available leads as I can exclude companies already owned by someone else in our CRM when looking for new accounts to try to sell to. Finally, before every meeting – face-to-face or online – I always open up the company card of the company I'm about to talk to in Vainu. I know that understanding their business and pain points will help me carry out smarter and better tailored conversations and that this will increase my chance of closing the deal. Greg works at Vainu.io as Business Development Manager. Likes sports, loves coffee. 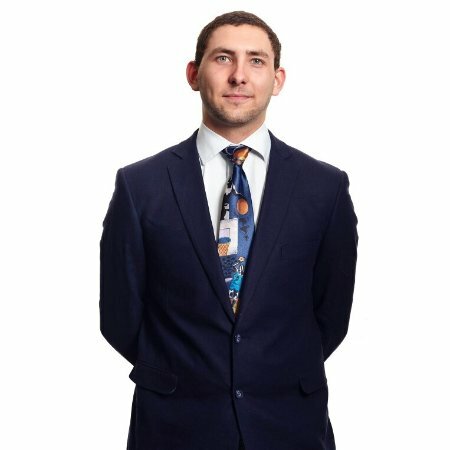 His sales career began with prospecting for rare pokémon cards on the playgrounds.